Bennett celebrates after winning the final stage of the Giro d'Italia last Sunday. AT BALLYHEST CROSSROADS in County Waterford, Sam Bennett began a long journey. From his first lesson as a teenager along the Dungarvan to Carrick-On-Suir road, few would have imagined the heights he would reach in his career. Bobbing and weaving for position among the best in the world at this year’s Giro d’Italia, Bennett proved beyond doubt that he belongs in that elite company by not only winning his maiden Grand Tour stage, but then sprinting to two more stage wins for a historic hat-trick. 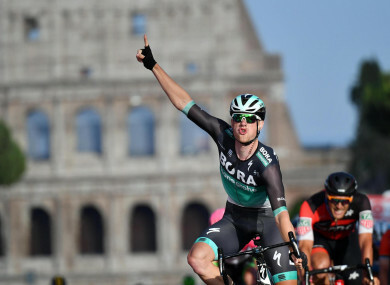 At 27, he becomes the first Irish cyclist since Sean Kelly in 1985 to win three stages at one of cycling’s ‘Big Three’ (along with the Tour de France and the Vuelta à España), and the first ever to do it at the Giro. On top of that, he finished a brilliant second to the experienced Elia Viviani in the overall points classification for sprinters, and even then he wasn’t to be outdone. His third stage win came on the final stage, spoiling Viviani’s lap of honour in Rome against the odds as he out-paced the Italian in a dramatic final sprint with the iconic Colosseum in the background. With O’Loughlin in his corner as coach and mentor, the young Bennett had the right guidance on his ride to the top. A promising amateur since his early teenage years, Bennett’s break came in the 2009 FBD Rás. Then 18, he became the youngest ever stage winner of the race with a victory in Clara, County Offaly. When he turned professional two years later, it was scarcely a surprise. “If you put two riders in a straight line, 500 metres from a (finish) line and say, ‘Right lads, off you go’, he’ll win against anyone in the world. Of the 21 stages in this year’s Giro, there were seven flat stages where Bennett could reasonably expect to challenge for the victory. Of those seven, he won three and Viviani won four, taking his first two stage victories in sprints at Stages 12 and 17 before his final-day triumph. Losing key team-mate Rüdiger Selig on the sixth day was an unwelcome twist as Bennett sought to plot his way past Viviani. “He was up against the Quick-Step team, he wasn’t just up against Viviani,” O’Loughlin explains. “He was up against one of the best teams in the world. “He definitely has that extra little bit, if he can get a straight line, to get to the (finish) line. “His team were missing that vital bit of horsepower to get him into positions so he had to use his brain a lot more and he obviously had to use his nerve as well because Quick-Step were trying to protect Viviani on front and behind. The Irish Olympic Cycling manager for Athens 2004 and again for London in 2012, O’Loughlin is still close with Bennett, and is well placed to trace his rise to the top. Still a Leaving Cert student, the 2009 Rás was Bennett’s first time competing in a cycling event of its distance and length. He looked to be struggling as the week went on but was able to find the motivation. His mother was battling cancer at the time and when he crossed the line to become the youngest ever rider to win a stage in the race, there was an outpouring of emotion. If anybody doubted the youngster, there were none in Clara that day. “I was coaching him back then — that was Stage 7 as well, his first stage in the Giro was Stage 7,” O’Loughlin explains. “That was Stage 7 into Clara and he beat Jaan Kirsipuu who was a top Estonian sprinter who had a lot of Tour de France’s behind him. It was a big win. “We actually put a plan together on that morning to try to get him into position because we knew if we got him into position, he’d finish the job and he’s being doing it ever since. “They’re a very close family, the two boys: Sam and Scott and Michael and Helen, so when something like that threatens the health of your family. The family had a tough year that year and it was just amazing to break through at that stage. “He was getting it hard in the Rás, he had just come out of school and he was going to college. He literally came out and his first 100-mile (race) on the bike was that week. Although he was born in Belgium, Bennett grew up in Carrick-on-Suir having moved there when he was four-years-old, and O’Loughlin began working with him when he was in his mid-teens at the Carrick Wheelers cycling club. He recalls a moment where Bennett first approached him and confessed that he couldn’t sprint, the very skill that would come to define his career in the years that followed. “When he came to me to coach him, he was 15 and he had been in our youth leagues; it was mainly mountain bike leagues that we used to run then in the club, Carrick Wheelers. “He approached me first to coach him with his dad. When I sat down with him, the first thing he said to me was that he wasn’t able to sprint! That was the first thing he wanted to learn and it didn’t take too long to teach him how to do that. At the peak of his own cycling career, O’Loughlin took Bennett out on the road for a number of sessions and was overwhelmed with the teenager’s ability at such a young age. Bennett was already leaving O’Loughlin behind in sprints. O’Loughlin knew that he was something special. “I can always remember taking him out. I was actually an Irish international at the time, and it was the first time I took him out training. “I remember the second day we went out just like yesterday. There’s a crossroads at home called Ballyhest and I was giving him a 10-metre head start when we were sprinting and he almost burned rubber. He just kicked. Rás veteran and former team-mate John Dempsey was a part of Bennett’s team when he made his breakthrough in Clara that day. The 38-year-old was an experienced rider and, similar to O’Loughlin, was initially unsure of the youngster’s potential initially. He was quickly convinced. “When he was younger, I didn’t have a whole lot of interaction with him because he was a younger kid in the club and we would never have raced together,” Dempsey explains. “I was hearing this for years and when he turned senior then and we started racing together, for the first few months he was doing his Leaving Cert. “He wasn’t sparkling really and to be honest, I was there thinking once or twice, ‘God, is he overhyped?’ but then you could see he really came around. In the years following his Rás breakthrough, Bennett won the Irish U23 Championship two years in a row before competing at the World and European U23 Championships. He joined the An Post – Sean Kelly team in 2011 before making the move to BORA-hansgrohe in 2014. A ninth-place finish at the 2016 Tour de France and three third-place finishes and a second-place finish in last year’s Giro d’Italia quickly proved that he Bennett was on the right track. As an out-and-out sprinter, Bennett’s priority on any mountain stages is to finish before the cut-off time, usually a straightforward — if exhausting — feat for a fit professional cyclist. But that doesn’t mean that he can’t have a bit of fun. On one of world cycling’s toughest climbs in Mont Zoncolan at this year’s Giro, Bennett was seen pulling a wheelie as he made his final ascent, showing off for the thousands amassed along the mountain side. He was the last to finish that day, but certainly put on a show. “He’s got amazing skill like that,” O’Loughlin says. “The crowd love it as well because by the time you hang around for the slow guys on the climbs, families like, when you have a three-year-old and a four-year-old and they’re waiting to see the last man on the road, I can imagine there’s lots of impatience. “Sam handed a young lad a bottle the day after he won one of his stages. There’s a video that went up. He was that kid not so long ago himself. Sprinting’s golden boy, Peter Sagan of Slovakia, happens to be one of Bennett’s BORA-hansgrohe team-mates, and an automatic first-pick for the Tour de France later this summer where he will be looking to reclaim the green jersey and win a remarkable sixth points title in seven years. It’s highly unlikely that Bennett will feature in France, though his success in Italy could well catapult him into position on the team for the third and final Grand Tour of the year at the Vuelta. “The Vuelta wasn’t originally on his program but I think they may be looking at that now. Dempsey, his former team-mate, believes that the last month has finally seen Bennett’s announcement on the big stage and that he can go on and taste more success in the future. “This has been in the works since 2009: (that was) the first step I suppose to get the notice of pro teams and whatever and then it takes a few years to come up through the levels and now he is at the top-level. Sam Bennett has had a long journey to get where he is now. The cycling world might have finally witnessed his full potential on one of its greatest stages, but for others, it was all so obvious a long time ago at the Ballyhest crossroads and in the little village of Clara. Email “From Carrick-on-Suir to the Colosseum: Sam Bennett's journey to take his place among the world’s best”. Feedback on “From Carrick-on-Suir to the Colosseum: Sam Bennett's journey to take his place among the world’s best”.